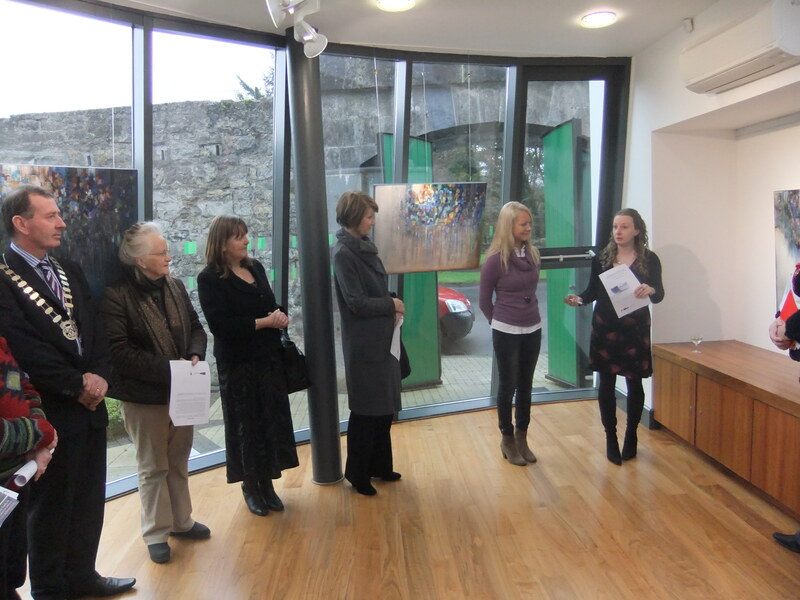 The Laois Arthouse Gallery, Stradbally hosted a short exhibition of Artwork at the Laois Arthouse Gallery, Stradbally from selected works owned by Laois County Council, which ran from Wednesday 11th December until Friday 10th January. 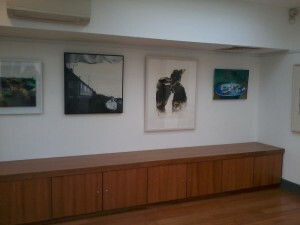 The exhibition includes paintings and sculpture by national and local artists. The artwork selected by the Arts Office, includes exhibits by well-known artists such as, John Keating, Bernadette Madden, Cathy Carman, Karen Hendy, Conor Brennan, Ray Murphy, Pat Byrne and Niall Fitzpatrick. Normally sited in Áras an Chontae, the temporary exhibition will give the public the opportunity to see and appreciate the work by these very talented artists in the Gallery space at the Laois Arthouse. Contact E: artsoff@laoiscoco.ie or W: www.laois.ie. John Keating has exhibited nationally and internationally including exhibitions in the U.S.A., Italy, Spain, Greece, Monaco and China. His work is included in private and public collections in Ireland, the U.S.A., Australia, Italy, Greece and England. Keating has guest lectured and tutored on the drawing studies course at the National Gallery of Ireland, National College of Art and Design, Dublin Institute of Technology and at the University of Pittsburgh, U.S.A. Most recent international Exhibitions in 2012/13 include exhibitions in London, Beijing, Milan and Rome. Along with receiving 2 International Awards, John also received a Gold Medal of Honour at the OFA Olympic Fine Art 2012 at the Barbican Centre in London and a second edition Water Cube Cup Award in Beijing, China. Bernadette Madden Dublin born Bernadette studied painting in the National College of Art and Design. She works mainly through the medium of batik (wax resist on linen) and also makes screenprints on paper. Her work is in numerous public and private collections, including those of the OPW, The Arts Council, AXA Insurance, The Ulster Museum and Trinity College. She has exhibited extensively in Ireland and abroad, including the USA, Germany , Norway and the UK. Cathy Carman, graduate NCAD, widely acclaimed for her large figurative work in wood stone and bronze. Her expressionist style is also evident in the many public commissions she undertook in the 1990s, notably at the Blasket Island Heritage Centre near Dingle, Tuam Square, Sligo County Council Buildings and Summerhill in Dublin. She exhibits regularly, in group and solo shows both in Ireland and abroad. 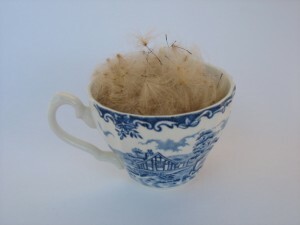 Karen Hendy is one of the Professional Artists in Residence at The Arthouse Studios, Stradbally. She is a graduate of NCAD and the Burren College of Art. Karen has exhibited at Ev+a International 2010, Eigse, The Royal Ulster Academy and the Royal Hibernian Academy. Karen’s is a Fellow of the Ballinglen Arts Foundation and her work is held both in Private and Public collections both home and abroad. Conor Brennan is a Portlaoise born artist who has a Bachelor of Arts (Honours) Degree in Fine Art at Limerick School of Art and Design. Graduated from NCAD in 2012 with a Masters in Fine Art. Before attending Limerick, Conor spent a year in Abbeyleix FEC, studying art and design. He currently lives and works in Portlaoise. Ray Murphy from Cork City, now lives and works at Emo Court. His work includes paintings and drawings inspired by the hidden architecture of Gandons’ masterpiece. Ray studied at N.C.A.D., and taught in Dublin before making Laois his home. Ray continues to persue his artistic career in the beautiful surroundings of Emo Court. Pat Byne from County Laois, moved to Galway in 2006 to study at Galway – Mayo Institute of Technology. He received a Bachelor of Arts Degree in Art and Design in 2009 and in 2010 received a Bachelor of Arts Honours Degree in Fine Art. 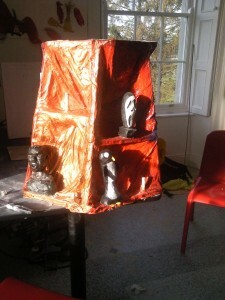 In January 2011 Pat was awarded a residency from Laois County Council at the Mountrath Artist Studio and accommodation. He held his first and second solo exhibitions, SHAPE at Leixlip Library Gallery in August 2011 and Corrosion at MadArt Gallery, Dublin in May 2012. 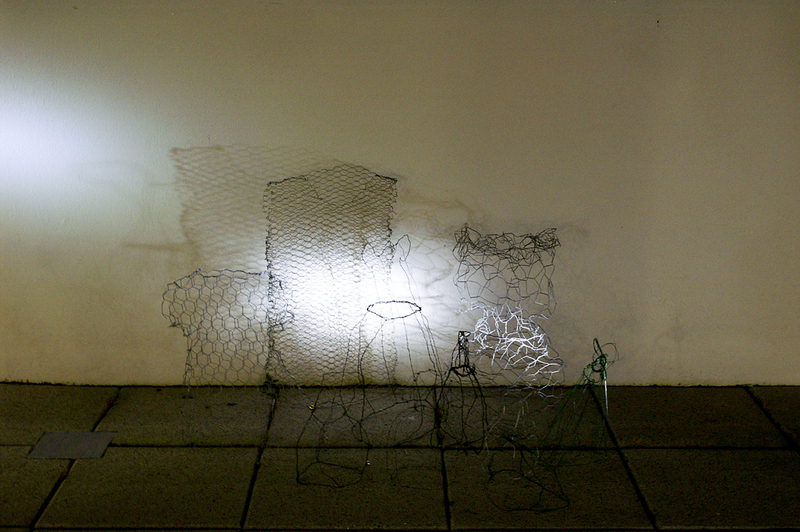 Pat collaborated with the Arthouse Gallery and Studios 2011 artists that were resident in The Arthouse Gallery and Studios to build an installation for the Electric Picnic. Niall Fitzpatrick is a Laois based artist. He graduated from Waterford RTC with a Diploma in Applied Art and works in archaeology, an occupation which provides him with subject matter for his historical illustrations. Investigating the ancient past and studying the landscape has evoked in him a need to express his love of place through art. This new body of work started during a 3 month residency with Nes Artist Residency in Skagastrond in North Iceland last summer during June July and August. The core theme of my work is based around the idea of playing with scale. 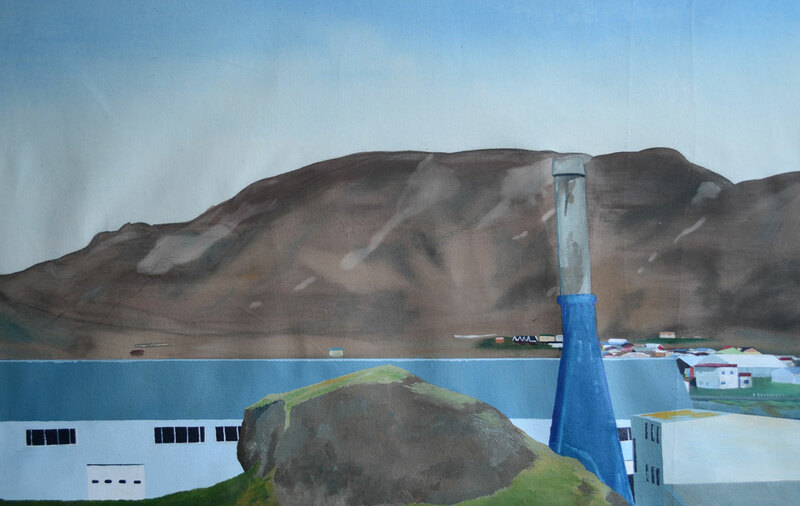 This is achieved in these new paintings by placing locations, landscapes and scenes in, on or around oversized everyday objects creating juxtapositions that give my work a surrealist quality. I tend to arrive at this point through the use of sketches, photography and collages, experimenting with images to find what works well together. As well as the aesthetic this work has underlying tones that take into account issues in our surrounding environment that are both natural and man made and also the result of interaction between the two. The Arthouse Gallery Stradbally will host a new exhibition of work presented by Cóilín Rush, Artist in Residence 2012/2013 at the Arthouse Stradbally titled “Works and Interactions” to open on Thursday 30th May at 6pm. This exhibition is the culmination of a 12 month residency by Cóilín who received the NCAD Graduate Bursary Award 2012/2013 funded through the Per Cent for Art Scheme. 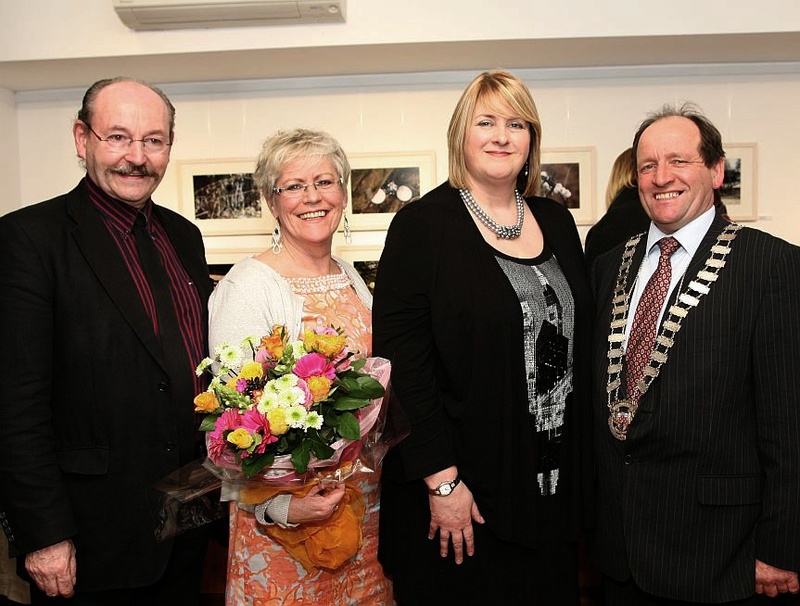 This was the second NCAD Bursary awarded by Laois County Council. The exhibition includes collaborative works from Cultúrbug, a community art group formed during the previous residency at the Arthouse, Stradbally, Co Laois with Artist Vera McEvoy, the first recipient of the NCAD Bursary. The Arthouse is delighted to welcome Vera McEvoy back to the Arthouse to officially launch the exhibition. I’m very pleased to announce the exhibition of works and documented interactions that have constituted my Residence at the Arthouse in Stradbally over the course of this last year. I have worked with three groups at various times and been thoroughly engaged by the activities we have undertaken. My principal focus has been in working weekly with members of the local community in all aspects of Art and lately in the construction of a final sculptural piece that has explained itself to me in a series of gradual coincidences. This piece requires quite an explanation and the story of its manifestation will form the primary part of my residential experience. I have also worked with an oil painting group weekly and have been so impressed with the progress that they have made in their own works that I have elected to include some amongst the exhibitions other artistic formats such as the video work I’ve been involved in with Stradbally Youth Theatre who I am delighted to say proved to be most accomodating in faciltating me. The short works and exercises we engaged in have improved my understanding of the medium immensly. This exhibition will be something of a document of my experience through the different engagements I have made and should speak of my process amongst vastly different media. 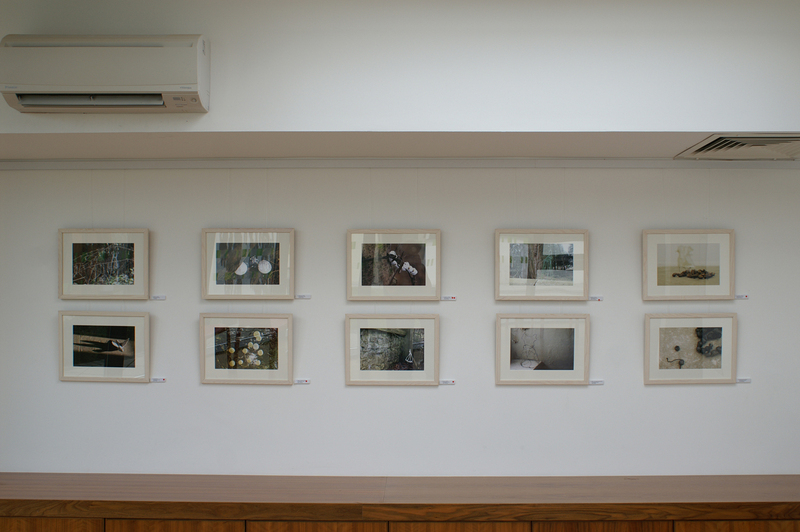 On display in The Arthouse and Library, Stradbally, Co Laois until 19 May 2013. The exhibition explores the prehistoric landscapes of Laois and Offaly, depicting the landscapes of the Slieve Blooms, the Rock of Dunamase, Clorhane and Croghan Hill as they would have looked in the Pre-Cambrian, Devonian, and Carboniferous periods. Originally commissioned to illustrate the book “The Geology of Laois and Offaly” by Dr John Feehan, the exhibition at the Arthouse, Stradbally is made possible through the support of the Heritage Council, Laois County Council Arts Office and Offaly County Council. Make good, make better is a forthcoming show by Saidhbhín Gibson at the Arthouse, Stradbally, Co Laois. It will comprise of new work produced specifically for the exhibition.The work marries aspects of man’s domesticity with elements of the natural world. This has been executed through delicate mark-making in the drawings and intricate thread based techniques (needlepoint lace) in the made objects. The work is a response to the natural world that exists around us, and our relationship with that which is not man-made. Exhibits comprise of drawings on paper, photographic work and a number of art objects. 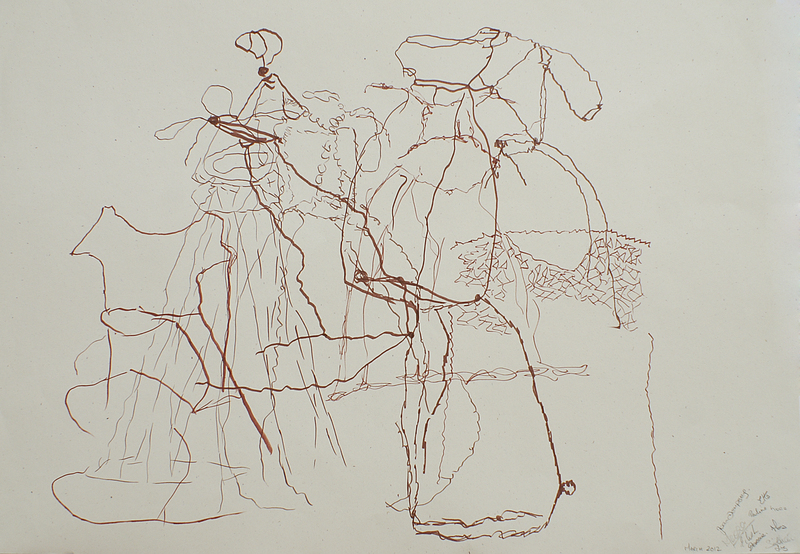 Also on show are thread based works incorporating needlepoint lace with components from trees. Rather than being an overt statement of a perceived improvement of nature by the artist, the title Make good, make better is purposefully ambiguous. The reflexive title refers both to the artist’s adornment of the natural artifact and also to our betterment through close association with nature.To mark the occasion of Make good, make better at the Arthouse there will be an illustrated talk on Saturday 13th April with John Duffy, Gardener, Emo Court, Co. Laois. John has extensive knowledge of the trees at Emo Court and the unique characteristics of the various species. An essay accompanying the exhibition has been written by Curator Carissa Farrell. Saidhbhín Gibson has exhibited both nationally and internationally since graduating with a Degree in Fine Art (D.I.T. Mountjoy Square). During 2012 she was selected for a variety of exhibitions including “Common Thread International”, Oakville, Canada, “Birr Vintage Week and Arts Festival”, “Winter Open”, Rua Red, and “Easter Small Works”, The Higher Bridges Gallery, Enniskillen. Make good, make better opens Thursday 4th April and runs until 24th April at the Arthouse, Stradbally, Co. Laois. The Arthouse Gallery, Stradbally, Co Laois are delighted to host an exhibition of paintings entitled “A Project in Two Parts”, by Martina O’Brien. Opening on Friday 11th January 2013 the exhibition will run until Friday 8th February. Born in England and brought up in Co. Kildare, upon finishing school Martina went on the study fine art and mixed media in Ballyfermot College of Further Education and then partook in Core Studies in NCAD. Whilst in NCAD she found that her interest in the technical side of Photography could not be furthered there so she continued her studies in Dun Laoghaire College of Art and Design in Commercial Photography where she was awarded a distinction on completion. After working in the field of Photography for several years, she returned to her first love – art making and since then has exhibited extensively both in Ireland and Internationally including New York[2008 and 2009], Beijing and London. She is currently enrolled on a MA in Visual Arts Practice MAVIS at IADT, a two year post graduate degree course, which is due to be completed in 2013. 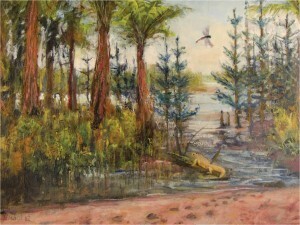 Martina O’Brien’s work is held in many National and International collections. Some Irish collections include An Bord Altranais, OPW – Templemore Training Centre, Leitrim National School, KN Energy ltd, Dublin and Hartnett Photography, Dublin. 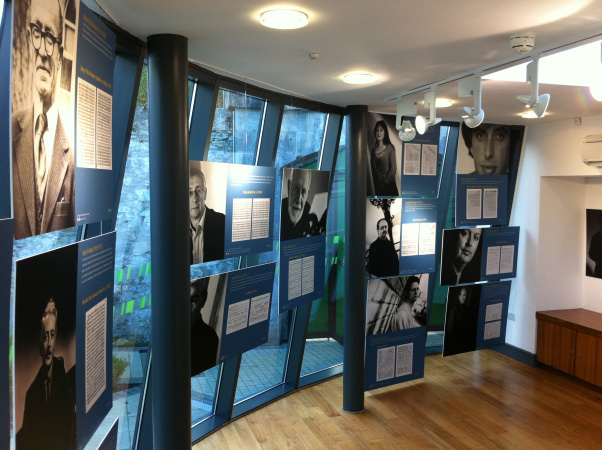 Don’t miss a wonderful new exhibition currently on display at the Arthouse Gallery, Court Square Stradbally called The Art of Sound: A Glimpse into the Creativity of Irish Composers. The Art of Sound is a photographic and multi-media exhibition devised by the Contemporary Music Centre. These photographs and music scores, linked to an audio soundtrack, offer us a glimpse of the composers in their workshop, a chance to enter their world, to share in the music making. By participating in this way we can enter into the real excitement of hearing the music on CD or, best of all, in live performance. Featuring: Gerald Barry, Mícheál Ó’Súilleabháin, Seán Ó’Riada, Jennifer Walshe, Seóirse Bodley, Barry Guy, John Gibson, Frank Corcoran, Rob Canning, Aloys Fleischman, Fergus Johnston, Grainne Mulvey, Kevin Volans, Judith Ring, Stephen Gardner, James Wilson, John Wolf Brennan, Benjamin Dwyer, DeirdreGribbin, Raymond Deane with audio-visual guide by Eamon Lawlor, RTÉ lyric FM. “Absəns Prezəns” by Vera McEvoy in collaboration with Cultúrbug March 2012. An exhibition entitled “absəns prezəns” opens in the Arthouse Gallery, Stradbally, Co Laois, on Thursday 15th March at 7.00pm. The opening will be performed by Professor Declan McGonagle of the National College of Art and Design. This exhibition is the culmination of a 12 month residency by Vera Mc Evoy in the Laois Arthouse and Cultúrbug, a small community art group formed by her in the Arthouse, Stradbally, Co Laois. The NCAD Graduate Bursary is funded through the Per Cent for Art Scheme. Vera McEvoy graduated with BA(Hons) in Fine Art from The National College of Art and Design, Dublin in 2010. She has exhibited both nationally and internationally and her work is already included in many public and private collections. This final year end exhibition, absəns prezəns, has further developed the presence of absence with promptings from local historical and archival research. This study initially formed the stimuli for further explorations, which culminated in a visual response permeated with individual creative skills. Over the course of the year Cultúrbug explored many materials including, ceramic, plaster, knitting with paper, plastic, and wire. 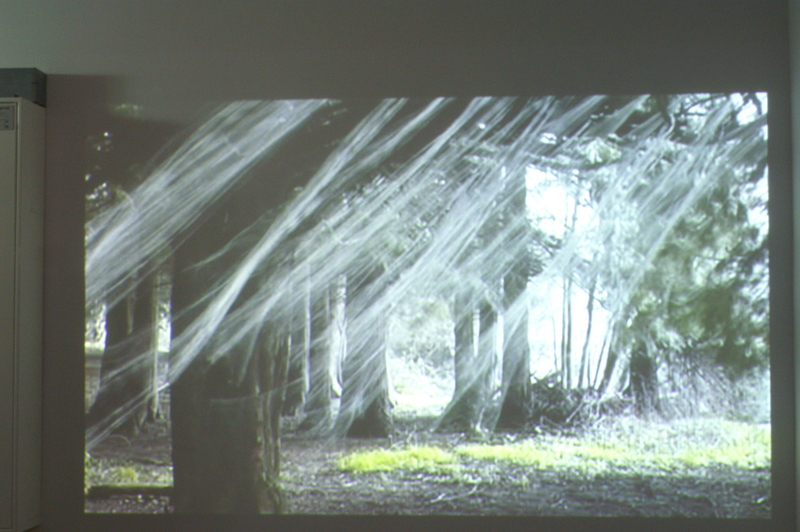 Temporary installations were placed in some beautiful natural landscape around Stradbally and documented in moving and still imagery. Various contemporary artists and their works were researched. Field trips included the Irish Museum of Modern Art, the Hugh Lane Gallery, the Douglas Hyde Gallery, the National College of Art and Design and Sculpture in Gardens at Ballintubbert House. Many artists visited the group to provide talks and workshops . Mountrath Studio artist Pat Byrne was there throughout the year to assist in numerous ways. Cultúrbug hosted an exhibition of their work last June entitled “First Expressions”. 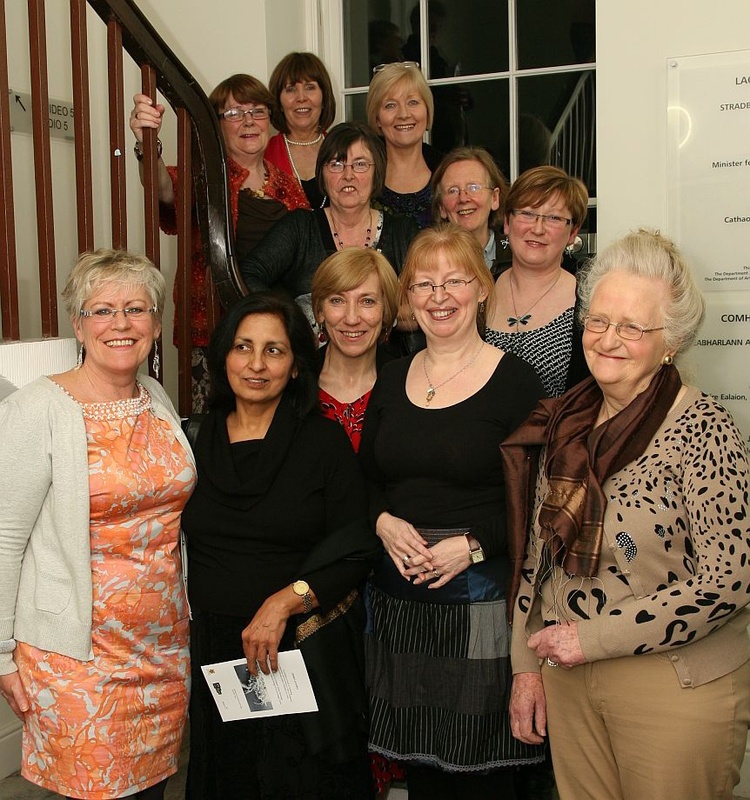 Cultúrbug is comprised of the following members: Mary Ahearne, Joan Dempsey, Eilish Dillon, Liz Fenlon, Pauline Harrison, Siobhán Kane, Ette Kennedy, Dorrie Moran, Meera Saxena, Nora White. Some thoughts and feelings from the group, March 2012. Cultúrbug’s exhibition on the 15th March, Absence Presence, (their second within twelve months) is the culmination of a year spent making art. Under the guidance of artist, Vera McEvoy, a group of locals experienced an extraordinary journey into art. They met in the Arthouse, Stradbally for a precious two hours each week where previously held ideas about art were challenged. This residency has been a fantastic opportunity for me in advancing my career within a collaborative and participatory community arts setting. The Arts office staff in particular, Laois County Council and NCAD, have been a great support to me both personally and professionally during the last year. I have forged many new, exciting and creative relationships which I know will extend beyond this residency. The success of my creative time here is attributed to Cultúrbug, the group of local volunteers who stepped into something new to explore, to discover, to learn and to experience all that was there. They embraced this journey with openness, trust and flexibility, as is evident in the large body of work that was undertaken, all of which has informed their final exhibition. A great big thank you to all Cultúrbug members, fellow artists, and to the wider community of Stradbally.